Midori Samson: aquí está el armadillo! I am a bassoonist in Austin, Texas. During my studies at UT and Juilliard, I have been working to improve as both a performer and teacher so that I can use music to learn about the world and its citizens. Since I believe there should be no separation between great artistry and social consciousness, I am especially passionate about teaching in communities with little access to art education. This is my place to write about my outreach adventures and goals: to explore, share, and learn. The team left the hospital yesterday for the last time. I said my goodbyes to my babies and it was heartbreaking so I tried to make it quick. I wondered, I know it's morbid, but if I'd ever see them again. I know I will be back here some day, but will they still be alive? I couldn't help but wonder. We all decided it was necessary for us to see the countryside and the pumas of Guatemala, and we figured we deserved a quick day trip after our hard work with the kids. 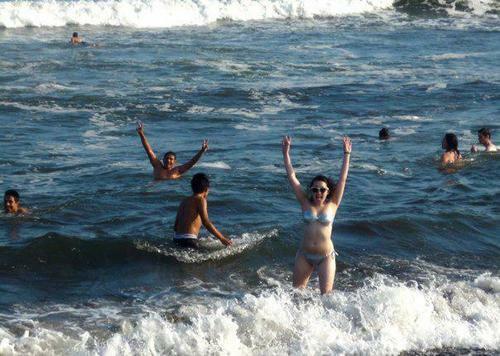 So we planned our day trip to Iztapa--a beach town! We were joined by Hector, Dennis, and 3 of his school friends. Hector and the boys picked us up in his van from our hotel (we have been staying in Antigua's hotel in the center of town for the last 3 nights so we could be closer to work) and we were off on our 3 hour drive across Guatemala to the Southern coast. We spent the day swimming, playing with the coconuts, and running around until we were exhausted. On our drive home, there was the biggest thunder and lightening storm I've ever seen and I was scared. So I fell asleep to calm myself. But about an hour later I was woken up to 3 teenage boys screaming at me in Spanish picking me up and lifting me out of the van. They set me down on the freeway next to a huge, snorting armadillo that they had just hit on the road. Dennis picked it up by the tail and handed it me saying something like, "you asked for it!". Once it was dead, they stuffed it into Dennis's school book bag and let me hold it all the way home. "My wife cooks the BEST armadillo. We'll eat it and then Ian can keep it as a drum! ", explained Hector. We continued to drive and as we did, we looked out the window in awe at the lava we could see dripping off Antigua's famous volcano in the distance. 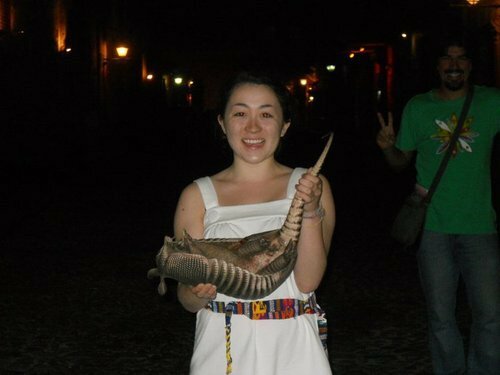 I had my long-awaited armadillo in my lap as I watched Guatemala's night scenery pass by. I couldn't have been more happy and it was the best way to end my last day in the beautiful country.